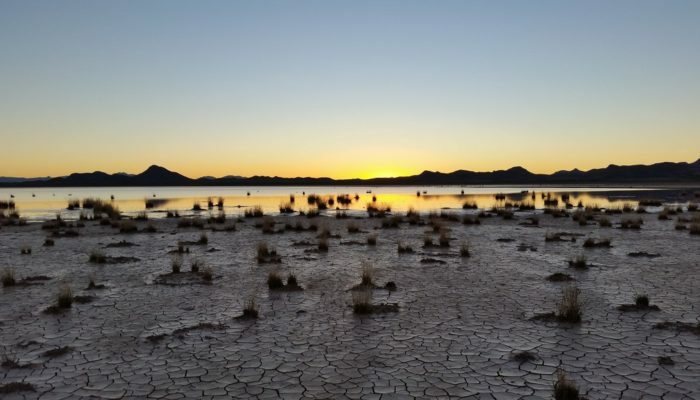 This picture was taken on the way back from collecting field measurements at the Lordsburg Playa in southwestern New Mexico, USA. The setting sun highlights the contrast between the dry, cracked soil and the standing water from antecedent rainfall. A playa is a flat topographic depression in arid or semi-arid regions that contains a large amount of deposited sediment. When the surface of the playa is dry, this deposited sediment is exposed and at risk of being entrained into the atmosphere by wind. With an extent of approximately 250 square kilometers, Lordsburg Playa is a dust ‘hot spot’ in the southwestern Unites States. Dust events originating from the playa are normally small, but they can contain high dust concentrations and occur frequently during the dry season in spring. The Lordsburg Playa is of particular interest to the local population, as the interstate highway I-10 crosses over the region. Under windy conditions, dust emissions from the playa can drastically reduce visibility on the highway and cause severe traffic accidents. In October 2016, I went on a one-week field trip to the playa, installing a temporary measurement site to study local dust emission mechanisms. At that time, parts of the playa were still flooded from summer monsoon precipitation. During the field trip, we observed a local, but strong dust event. The event started in the morning and peaked at around 9:00 am when visibility was reduced to a few meters for a short time. Fortunately, the dust was blown northward during this event and the highway was not affected. Visibility recovered shortly after, but small-scale dust phenomena such as dust plumes and dust devils occurred almost continuously during most of the day.